Wool coats are a fashionable winter choice for women each year. They're warm, usually not immensely bulky, and many styles can be worn year after year without looking out of style. A flattering fit and wonderful color for your complexion that works with your existing wardrobe can make your wool coat quickly become an essential part of your wardrobe. There are many styles that are both trendy and classic on the market to choose from, so there's something for everyone looking for an extra warm layer in the fall and winter. The Crombie coat is a classic, retro style with long, lean lines. It will flatter most body types. Tall women with long limbs and a boyish shape may especially enjoy this style. The Rag & Bone Emmet Crombie Coat, a single-breasted camel-colored Italian wool blend, is on the more expensive side at just under $1000.00 at Rag & Bone. However, if that fits your budget, you may love the slim fit and long length. The leather details and red under the collar and under the belt give it extra visual interest and an edge of sophistication. It's available in sizes 00 to 12. 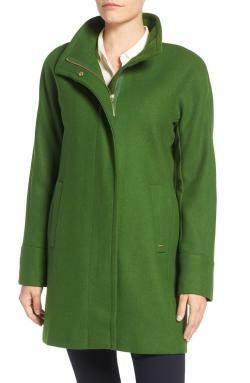 There's an option at Monsoon for under $300.00, the Tamsin Crombie Coat. It's available in sizes four to 18 in a gorgeous pink shade, closes with two buttons, and has two flap pockets. The Libbie Crombie Coat is another Monsoon option, this time in charcoal and just over $200.00. It's available in sizes four to 18. It's unlined and more lightweight than the Tamsin. The stadium style has similar lines to the Crombie, but it's generally more casual. The collar is designed to stand up to keep you warm, and the length hits about mid-thigh. Overall, these are meant to be warm but not bulky. The Ellen Tracy Wool Blend Stadium Coat comes in a selection of bold, bright colors for those who don't prefer to wear deep colors and neutrals in the colder months of the year (though there are neutral options as well). Its shape is similar to the Emmet Crombie coat above, with a less tailored fit. It's just over $100.00 at Nordstrom and available in apple, black, marigold, and oatmeal. It's available in regular sizes from six to 16, and petite sizes from 2P to 14P. The front-zip closure is hidden, there's a stand collar to keep you warm, and there's an interior pocket in addition to the exterior ones. The percentage of wool included varies by color. The Woolrich Alpine Wool Fleece Long Coat comes in black or gray heather and is available at Zappos for just under $100.00. Get it in sizes XS to 2XL. Princess seams add feminine shape, but it still maintains its casual, relaxed fit that will keep you comfortable when you're on the go. It pairs best with jeans and t-shirts or sweaters. The Stadium-Cloth Cocoon Coat from J.Crew is under $400.00 and available in black, sandstone, or heather dusk in sizes 000 to 16. It's made from an Italian wool and nylon blend and features a zip closure, long length, and convenient side pockets. Military style coats typically have notched collars, a mid-hip length, flap pockets, and tailored fit. In addition, they tend to have rows of metallic buttons down the front. Any body type will look good in this shape, but hourglass shapes will love the cinched middle while pear shapes will appreciate the loose fit around the bottom. The classic military style coat, the Lauren Ralph Lauren Wool-Blend Military Coat, is available for just over $100.00 (Dillard's) in black or navy, in sizes six through 12. It hits about mid-thigh and offers a full button closure. With its notched collar, long sleeves, waist flap pockets, and back belt tab, this is a style that will look good for years. The Vince Camuto Double-Breasted Military Coat is available for less than $200.00 at Macy's. It's available in gray or olive in sizes XS to XL. It's knee-length and features two rows of metallic buttons. The zippered hip-level pockets give this classic style an interesting twist. The ASOS Wool Blend Coat in Midi Length with Military Details comes in a teal shade, accented with metal buttons. This is a midi length jacket, so it's longer than most of the other military-inspired options on the market. The relaxed fit combines with the more tailored feel of the military coat for an intriguing style that costs less than $100.00. The cutaway wrap style is loose and classy, and tends to look great on women with large busts and apple shapes, though some of the slimmer fits are ideal for slight, straighter frames. The collars on these are usually designed to stay close to the neck and wrap the wearer in warmth or they're wide and shawl-like for comfort. If you like a wrap style, the Lauren Ralph Lauren Cutaway Wool Blend Coat comes in gray, and it's available in medium or large for about $150.00 at Dillard's. Pear and apple shapes will like the cut of this one, with its asymmetrical style, relaxed fit, and warm funnel neckline. It offers a single button closure. The Cole Hann Signature Belted Asymmetrical Wool Blend Coat is available from Nordstrom for about $200. It comes in sizes two through 14 in a cozy wool blend. It's available in bordeax, black, and platinum ( a gorgeous gray). It has has a slim belted fit, cozy envelope neckline, and is made of a wool/polyester/rayon blend. It's about mid-though length, making it a versatile style. 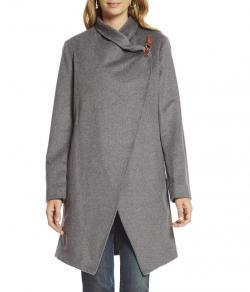 The T Tahari Marla Wool-Blend Wrap Coat from Macy's is available in mink, merlot, or macrame for less than $200.00. Its feminine shape will look beautiful on curvy bodies, and its sizes extend from XXS to XXL. It's sophisticated enough to complement your work wardrobe, but cozy and relaxed enough to look perfect at home or out and about on the weekends. Wear a classic peacoat style to work with a dress or on the weekends with a casual turtleneck and jeans. 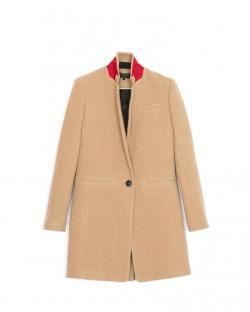 This is another wool coat shape that will look great on all body types. Some flare out more than others below the waist and resemble frock coats. 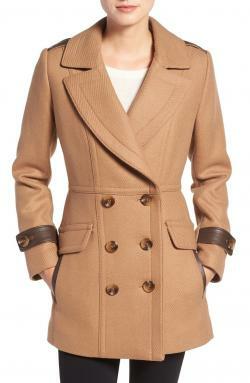 This Trina Turk Chloe Wool Blend Peacoat is available for less than $500.00 at Nordstrom. Its classic shape and color make it a wardrobe staple, something that will go with almost any color, and any style of clothing. It's available in sizes two to 14, in black or camel. Instead of a belt that wraps all the way around and could potentially add bulk around the middle, this one simply has a back belt. In addition, there are front flap and front welt pockets, belted cuffs on the sleeves, and a front button closure. The L.L. Bean Classic Lambswool Peacoat is available in a variety of colors: camel, loden, royal plum, light grey heather, and navy, in misses', petites', and women's sizes. It hits below hip level and has shape without being too tailored, and it's designed for warmth without bulk (ideally worn with a sweater). The Kate Spade New York Double Breasted Peacoat is available at Zappos for less than $300.00, in black or blue pearl (sizes medium, large, and extra-large). The classic shape has the notched collar, hip-length, pockets outside and inside, and a button closure. The overall style of this coat makes it look great on all body types. Tailored styles generally look more professional than coats with a relaxed fit and can add curves or accentuate an hourglass figure. Look for a slight A-line cut at the bottom to add balance to an apple shape or larger bust. Decide if you prefer the quick ease of a zipper closure or don't mind a row of buttons. How classic is your style? Do you prefer a more sporty look? Consider where you're going to wear the coat and what your current wardrobe is like, plus decide how long you'd like for a new coat to last. Aiming to get decades of wear out of it? Go for a more classic peacoat style over trendier options that may feel out of place or obviously outdated in a few years. Don't be afraid of color, but if you don't think you'll want to commit to a single bright or bold color for years, shop for bargains while you look for an apple green or hot pink coat, and then invest more in a coat in navy, black, camel, or charcoal gray that will never go out of style. Consider what you may want to wear under your coat, and make sure there's enough room for it. If you tend to wear thick sweaters in the winter, consider sizing up. If you're the type who layers a tank or tee under a thinner sweater, then throws a coat and scarf on top, you may be able to get away with a smaller size. When shopping for a wool coat, you'll usually find that they all need to be dry cleaned (check to be sure, though, if this is something you would prefer to avoid). Assuming that's equal across the board, choose a coat that will suit not only your body type and complexion, but the rest of your wardrobe and how long you like to wear an article of clothing before purchasing something new.